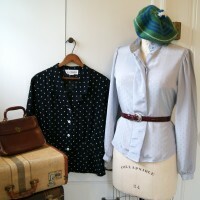 Hello dear vintage lovers, and happy GRATEFULNESS GIVEAWAY FRIDAY!!! Yes! It’s approximately 8AM Friday morning as I type these words and I feel like I’m gearing up to visit my favorite amusement park, I’m SO excited for today’s story of gratefulness and adjoining giveaway to say THANKS! 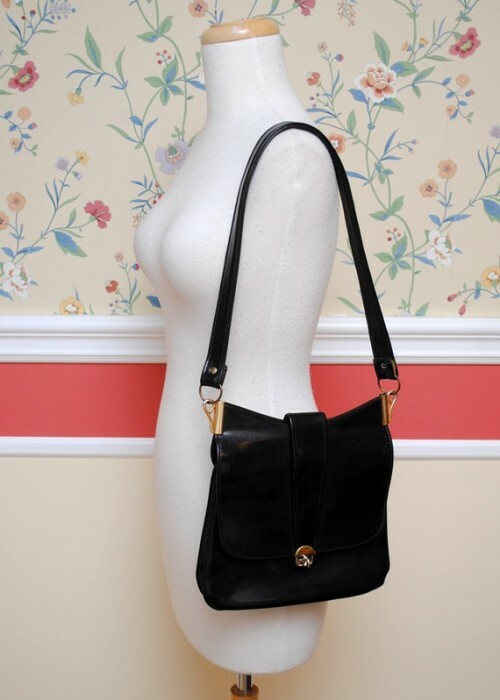 for your support of vintage fashion through Sammy Davis Vintage!! Today’s giveaway isn’t only one of the most generous I’ve had the blessings to offer you [just take a look at the pic above to see what’s being offered!] but the giveaway is a demonstration of just how far [but close]vintage love can travel thanks to the beauty of the Internet. 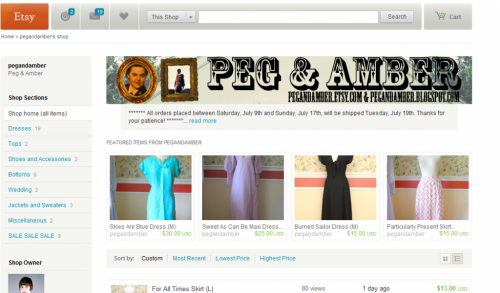 I featured this week’s giveaway sponsor Peg & Amber in my Shop Finds a couple months ago, and much to my delight, the dress I featured from her shop SOLD to one of you vintage lovers! The vintage brains & beauty behind Peg & Amber — Amber! — messaged me a sincere thanks. I wrote back to continue the discussion, and our email exchange revealed that we were a.) the same age b.) both from Pennsylvania and c.) WENT TO THE SAME COLLEGE! I know, crazy! You vintage lovers will probably agree that “the world is a small, small place!” While Amber and I never crossed paths in the collegiate environment, thanks to a simple email exchange and mutual love for vintage, we digitally bonded as if we had actually met during freshman orientation and been friends ever since. This week I kickstart my gratefulness giveaway with a story on why random acts of kindness rock love into the lives’ of others and that of our own. I can’t wait for you to share your recent experiences of kindness and its random potential for feel-good vibes spread far & wide shared in the comments to enter today’s giveaway! 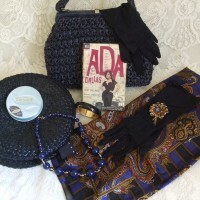 Keep reading after the jump to learn how to enter to win this amazing prize pack from Peg & Amber Vintage! Thank you ALL in advance for entering today’s giveaway and as you’ll read in today’s gratefulness story, inspiring random acts of kindness in us all! See ya’ll [and perhaps share your stories of random kindness?] on Facebook, Twitter, Tumblr & YouTube. Can’t wait for one of you to win today’s EPIC VINTAGE PRIZE PACK! I’ll be the first to say, “Just give it love” when we are frustrated by our circumstances, experiencing uncomfortable emotions or are feeling all-around disconnected from our natural abilities to “feel good,” no matter the moment. Recently I’ve been reminding myself not just to give moments I don’t like love, but to give love all the time and at RANDOM moments, too. The spontaneity of giving is as exciting as receiving, and we are conditioned to default first to LOVE of others which is the greatest love we can ever give ourselves. Logging onto our email or Facebook accounts to send a message or leave a wall post “just saying hi” is a random act of unexpected kindness & connection. Sending flowers to our moms not on her birthday or Mother’s Day, or finding the perfect vintage dress for a friend and buying it for her “just because you couldn’t pass it up” is thinking above and beyond the “me” in moments when the easier path is just to think of ourselves. This I try to remember in moments of judgement: We are all the exact same, experiencing the same emotions but simply within different life circumstances of fate and our choosing. I just finished ultra-marathon runner Dean Karnaze’s book RUN!, where in one chapter he writes on his “random acts of kindness runs,” where he carries $10 one-dollar bills and strategically places them under the windshields of 10 cars he passes. When the owner arrives at his car, he’s pleasantly taken aback by this “random dollar” on his windshield. It’s like a tooth fairy leaving you money under your pillow as an adult — what feelings of excitement and abundance!!! Paying the toll of the car behind you, sending cards of “thanks” without a holiday or cultural celebration inspiring it, buying lottery tickets for your entire office staff … these are the random acts of kindness which make people feel so good to be alive and in you doing so, inspires that same amazing feeling of inner-wealth, health & gratitude within you, too. I am the first to admit that while I believe in giving all scenarios love, I do not step outside of myself to simply give for the sake of giving often enough. I recognize that I sometimes give with expectations of a return, or that I “share” with others not to make THEM feel good, but to make ME feel good. Today’s post is to inspire me to think of being random and 100% selfless in my acts of love, and not just because “what I give is what I get.” But because what I give is what others get, first. 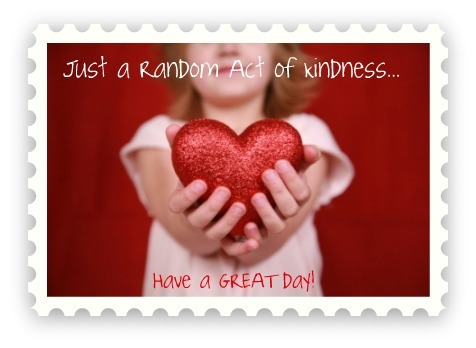 I can’t wait to demonstrate a random act of kindness today and hopefully, everyday forth! Thank you to all for inspiring me to inspire YOU … and myself! 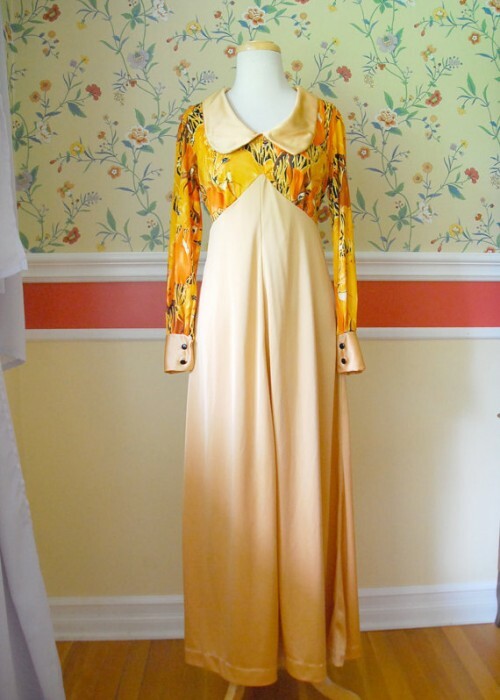 This week’s GENEROUS vintage prize pack from Peg & Amber Vintage includes three very special and very unique vintage pieces … including 2 ’70s maxi dresses in beautiful summer shades of yellow, and a practically posh leather satchel shoulder bag! 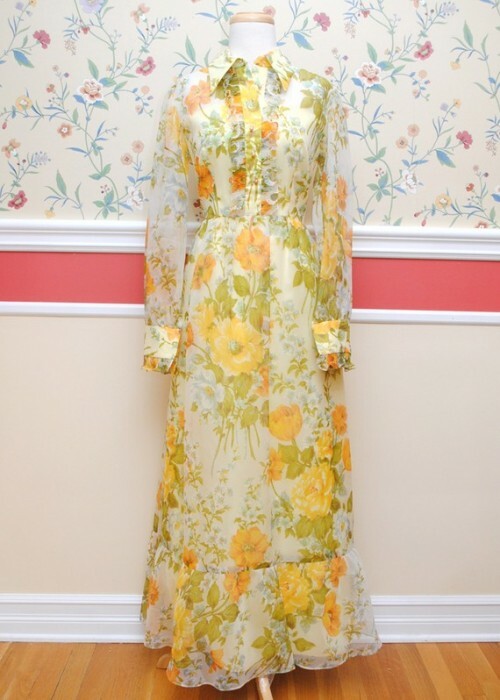 For a chance to win the entire vintage fashion prize packed listed above valued at $49, you must enter between today [Friday, July 8th] and by midnight on Monday, July 11th. You can only enter once, and all winners will be drawn at random using the site random.org. Winners will be announced by Wednesday, July 13th. **Entrants/Winners must be legal U.S. residents of the lower 48 states (not including Alaska and Hawaii) and at least 18 years old as of July 8th, 2011. I am blessed to live in an area where people are generally nice to one other and I can experience random acts of kindness often. They are contagious! Most recently I had one of the nicest things done for me. After I grab my coffee I have to merge out on US 19 in one of the most dangerous strips to drive to work. Usually you can expect people to fly by and not let you in as they are all trying to get to work as well. However one gentlemen rebeled, stopped and let me pull out. A seemly small gesture that then caused me to stop on the way home and let some random guy know that his back tire was getting low. I know these things seem small and almost silly but they really do make a huge difference! So you do Sammy! Thank you for this awesome giveaways and inspirational words. When I first started to really get into scrapbooking and found online forms on sites like Myspace. Some of the other crafts were kind enought to send me a box of goodies, so that I would be able to have some stuff to get started, because at the time I think I was 14 or so. So that was really nice of those few people, and it has really stuck to me. So, now when every I swap with people I allways try to make the stuff I send the best and put extra stuff in the package that they were not expecting. Thanks, for the giveaway, and have a great day. I was just sitting here thinking what my latest act of random kindness? I give away my gifts and my things freely, not sure if its as much to random people but anyone who needs.Well how about just this afternoon, I offered a friend and customer who had just lost a family member this past weekend a shopping spree in my store for her B-day. It was one little thing I could do lift her spirits and THAT warms my heart! Got a gift..give it away I say. KINDNESS multiplies! Lately two of my friends have been going through some money issues. I have been bringing all the food that I know I’m not going to eat or don’t want to them. I don’t think they really know why I’m doing it. I always just say, I don’t think I’m going to eat any of this and didn’t want it to go to waste. I know it’s atleast a little helpful to them. I really love random acts of kindness. One I practice often was inspired by a book i once read. every time I get small change from a store, i’ll drop it on the ground as I walk. A penny here and a nickel there doesn’t mean much to me, but it does make for a very happy small child after they find such a treasure! A person just came up to me on the bus and handed me a cookie when I was little! It was a nice old lady. lol! Great topic! I love ROAKs – but part of the magick is about not telling, right? I will say that it gives me great joy and delight to practice them, no matter how tiny or large, and I do it daily. And the more you do, the more you get. Truth. So the most recent ROAK of which I was the recipient? This morning, at a yard sale, when I was trying to carry too much Good Stuff to the table where I needed to check out, and a very kind gentleman who there with his wife gallantly came to my rescue, taking most of my load to the table for me – then insisted on carrying it all to my car. Totally random, totally wonderful, and I left with a smile on my lips and a song in my heart. My sister has cerebral palsy. She is 15 and a freshman(now sophomore!) in high school and obviously high school is a hard time in teenagers life, she gets a little worse. She has a mild case of it, so she can still walk, talk, be “normal”, she just has a limp and staggers when she walks. People are constantly making fun, laughing, or simply staring at her because of how she walks. There have been many times where she has fallen in the hallways and people help her and get her books together. It isn’t much, but it’s an act of kindness that I know makes her feel better and realize that she’s worth that extra effort. 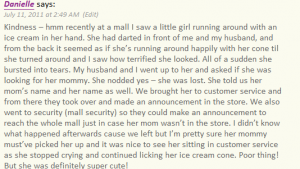 Kindness – hmm recently at a mall I saw a little girl running around with an ice cream in her hand. She had darted in front of me and my husband, and from the back it seemed as if she’s running around happily with her cone til she turned around and I saw how terrified she looked. All of a sudden she bursted into tears. My husband and I went up to her and asked if she was looking for her mommy. She nodded yes – she was lost. She told us her mom’s name and her name as well. We brought her to customer service and from there they took over and made an announcement in the store. We also went to security (mall security) so they could make an announcement to reach the whole mall just in case her mom wasn’t in the store. 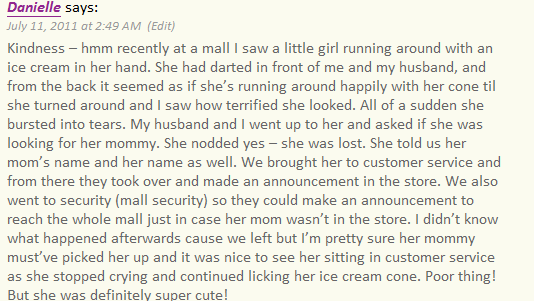 I didn’t know what happened afterwards cause we left but I’m pretty sure her mommy must’ve picked her up and it was nice to see her sitting in customer service as she stopped crying and continued licking her ice cream cone. Poor thing! But she was definitely super cute! When my daughter was 4, I took my eyes off of her for a couple seconds, and when I looked again, she was gone. I thought she had went to the playground so I frantically ran to see if she had went there. Actually, as I would later find out, she had went to see the easter bunny. It was another concerned mom who had noticed she was alone who kept an eye on her and reported it seemed she had no mom around until I was able to find her with the help of security. It was a random act of kindness I’ll be forever grateful for.